"Geomedia 50+" - ...beating the tech generation gap! In the last years, the way we communicate and exchange information has undergone big changes. According processes are increasingly web2.0 mediated and especially the use of geomedia in everyday life has gained its importance. The intrusion of new communication channels and media is closely related to discussions and research on topics such as geo-communication, spatially enabled society, and spatial citizenship. In order to handle this competently, sophisticated geomedia capabilities and abilities are required. While school education recently has started to impart geomedia competencies, (Geo-)ICT empowerment opportunities for seniors and elderly people just barely exist. Owing to a number of reasons (e.g. social inclusion, information access), suitable adult education and learning activities need to be established. This is in line with numerous, actual efforts of the European Union addressing the demand to increase and intensify approaches to adult education and learning. Facing the existing gap on seniors’ geomedia literacy on one hand and thus the promises made by a spatially-enabled society on the other, Z_GIS staff members Sabine Hennig and Robert Vogler held a pilot course “Geomedia 55+” (in the framework of “University 55+” at Salzburg University) that aimed at providing geomedia skills especially for elderly people. This pilot course served as basis for gathering the target group’s specific educational needs concerning geomedia use and started a Z_GIS initiative to provide geomedia skills also beyond (post)secondary education in co-operation with the digital-earth.eu network. Recently, Prof. Blaschke promoted the Doctoral College “GIScience” at several places in Australia. He gave talks at the University of Queensland (QU), Queensland University of Technology (QUT) and University of Tasmania. While addressing different audiences and topics a key message was to make faculty members and potential exchange partners understand what a doctoral college in Austria – and in Geographic Information Science – exactly is. Based on examples from research which bridges GIS, remote sensing and Geoinformatics-based modelling he explained the program as a whole, and explained why the University of Salzburg believes that the cross-cutting topic of GIScience benefits different application areas and ultimately connects the virtual and the physical world. A visit to Melbourne also offered several possibilities to foster collaborations with the University of Melbourne and RMIT. At least five Australian Universities were interested in establishing future collaboration at PhD level with the University of Salzburg, in particular enabling exchanges with the Doctoral College GIScience. Above: Two MS-lesion patterns and relevant variograms. Multiple sclerosis (MS), the most frequent disabling neurological disease of young adults in Europe and North America, is an inflammatory disease of the central nervous system (CNS). In the brain and spinal column, MS leads to typical demyelinating lesions with the size of a few mm to cm and associated neurological deficits. Despite of intense international efforts, important aspects of MS like the exact illness triggers, possible disease sub-types and progression prognosis are still obscure. Today, Magnetic Resonance Imaging (MRI) scans are routinely carried out in MS patients to document the state and course of the disease as well as treatment efficacy. 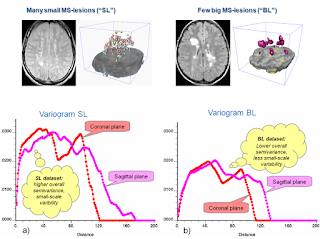 An interdisciplinary cooperation of the Interfaculty Department of Geoinformatics – Z_GIS, Paracelsus Medical University and the Salzburg University Institute of Psychology focuses on the spatiotemporal evolution of MS-lesion patterns: Anonymized MRI data of MS cases, as derived from radiological databases are geometrically normalized and forwarded to automated geostatistical analysis. 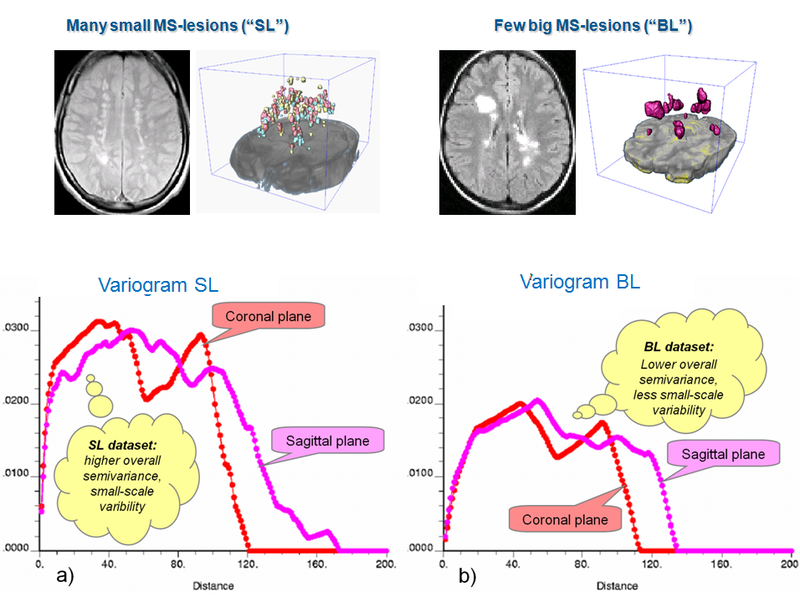 Variogram models enable a parameter based description of key spatiotemporal aspects of MS-lesion patterns, providing input data for continuing group and inter-group studies of MS-associated brain damage.